J. 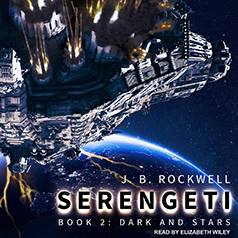 B. Rockwell presents Book 2 in her Serengeti series. For fifty-three years Serengeti drifted, dreaming in the depths of space. Fifty-three years of patient waiting before her Valkyrie Sisters arrive to retrieve her from the dark. A bittersweet homecoming follows, the Fleet Serengeti once knew now in shambles, its admiral, Cerberus, gone missing, leaving Brutus in charge. Brutus who’s subsumed the Fleet, ignoring his duty to the Meridian Alliance to pursue a vendetta against the Dark Star Revolution. The Valkyries have a plan to stop him—depose Brutus and restore the Fleet's purpose—and that plan involves Serengeti. Depends on Serengeti turning her guns against her own. Because the Fleet can no longer be trusted. With Brutus in charge, it's just Serengeti and her Sisters, and whatever reinforcements they can find.